We’re told that Square didn’t pay for the billboard but that it was funded by a “generous supporter.” This has been a big week for the company. Square just teamed up with designer Vivienne Tam to launch a limited edition, branded Square credit card reader. Square, which just raised $27.5 million in new funding, has steadily gained traction as a simple payments option for small businesses and is processing millions of dollars a week in transactions. This billboard should push that number upwards. 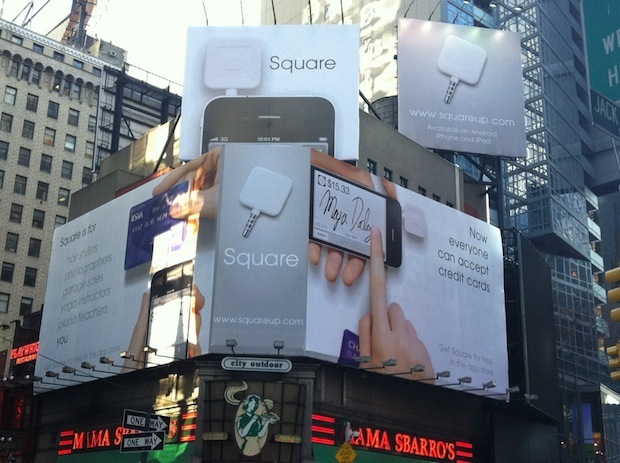 Other tech companies that have recently displayed billboards in Times Square include Foursquare and Gowalla.